It is now widely accepted that cancer results from an accumulation of genetic alterations, including subtle sequence changes, alterations in chromosome number, chromosomal translocation, and gene amplifications (1). 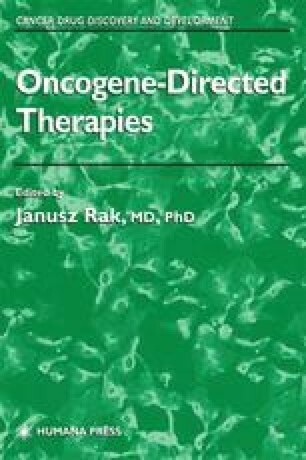 These alterations result in a gain of function of oncogenes and a loss of function of tumor suppressor genes, leading to uncontrolled growth, differentiation, and apoptosis. The number of mutations required for a tumor to develop in human populations is age-dependent, and seven or eight acquired mutations in a cell are required in commonly occurring solid tumors before an overt malignancy becomes evident (2). The ectopic expression of the telomerase catalytic subunit, in combination with two oncogenes, the simian virus 40 large T and an oncogenic allele of Ha-ras, lead to direct tumorigenic conversion of normal human cells (3). Therefore, there is a succession of genetic alterations, each of which conferring one or another type of growth advantages, lead to the transformation of normal cells into malignant tissue (4). Cancer cell genotypes are a manifestation of six essential alterations in cell physiology that collectively dictate malignant growth through various mechanistic strategies: self-sufficiency in growth signals, insensitivity to growth-inhibitory signals, evasion of apoptosis, limitless replicative potential, sustained angiogenesis, and tissue invasion and metastasis (4). This classification is needed for a better understanding of molecular mechanisms involved in tumorigenesis and for designing appopriate therapy.